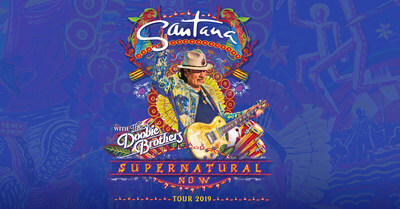 LOS ANGELES, Jan. 16, 2019 /PRNewswire/ -- Rock and Roll Hall of Fame guitarist Carlos Santana has announced he will hit the road with his band across North America this summer for the Supernatural Now tour. The three-month, 29-date celebration will commemorate two of the most important milestones in the iconic guitarist's career: the 20th anniversary of his groundbreaking, multiple Grammy-winning album Supernatural and the 50th anniversary of his momentous performance at Woodstock. Thirty years before Supernatural, Santana mesmerized the then record-breaking audience at Woodstock – the band's performance of "Soul Sacrifice" is regarded as one of the high points of the classic concert documentary. "I'll never forget the way the music sounded, bouncing up against a field of bodies," says Santana. "It's well documented that I was tripping during our performance. At one point the guitar turned into an electric snake, twisting and turning. I kept willing the snake not to move and praying that it stayed in tune. By the time we played 'Soul Sacrifice,' I was able to breathe and focus, and the band crystalized as one. The magic of Woodstock would not have been possible without Bill Graham. No one had heard of us yet, but he made sure we were on the bill. He is always in my heart."